Effective January 1, 2018, Carver County requires on all sales a Subsurface Sewage System Treatment Form along with the certificate of real estate value, to be presented to the county auditor’s office. 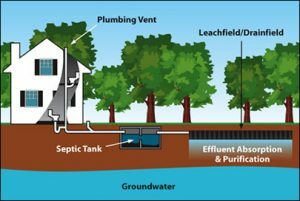 While I think it’s a good idea to handle such things at the time of sale, I am reminded of the problems we had a few years ago, where some recorders were refusing to record deeds without Septic Systems being in compliance. So along with the law as to what is recordable, MSA 507.24, there is also a law stating that a deed cannot be kept from recording for lack of this document. A local unit of government may not adopt and enforce ordinances or rules affecting new or replacement Individual Sewage System Treatments that are more restrictive than the agency’s rules. Jeanne Comment: This law was enacted because a few small municipalities enacted local ordinances to stop the recording of documents when sewer systems were not up to local standards. While a good idea in concept, abstractors, title companies, attorneys and banks do not search local ordinances when searching title, so that when a loan closed and the documents were unrecordable for extensive periods of time, the lenders interests were not secured and lenders threatened NOT to place any mortgage loans in those locales. Accordingly, the bar association, in conjunction with the Minnesota land title Assoc. succeeded in passing a law to negate the local ISTS ordinances. It is the author’s opinion that anytime a local unit of government attempts to adopt or enforce an ordinance or rule, when its effect is to prevent or delay recording with the county recorder or registrar of titles, of a deed or other instrument that is otherwise entitled to be recorded, either the law will be expanded, or another law passed to prevent the same problem.